Theodore Roosevelt, 26th President of the United States, was born this day 159 years ago on October 27, 1858. A son of New York City, the timid Theodore overcame his childhood asthma with his robust physical pursuits matched only by his professional ambition as a career soldier, Assistant Secretary of the Navy, Governor of New York, and finally the youngest President of the United States when he assumed office at the age of 42 after the assassination of William McKinley. The proximity of T.R.’s birthday to Halloween always makes me think of Arsenic and Old Lace, the Frank Capra-directed dark comedy set one Halloween in Brooklyn involving Mortimer Brewster (Cary Grant), his two dangerous but darling elderly aunts, and – like all of the best movies of the 1940s – Peter Lorre being Peter Lorre. Originally a play (and doubtlessly one that your high school has performed), actor John Alexander reprised his role from the stage as “Teddy” Brewster, Mortimer’s delusional but harmless brother who believes that he is Teddy Roosevelt. I’m taking the blogger’s imperative and dedicating this whole week to Boardwalk Empire and its celebrated throwback style. 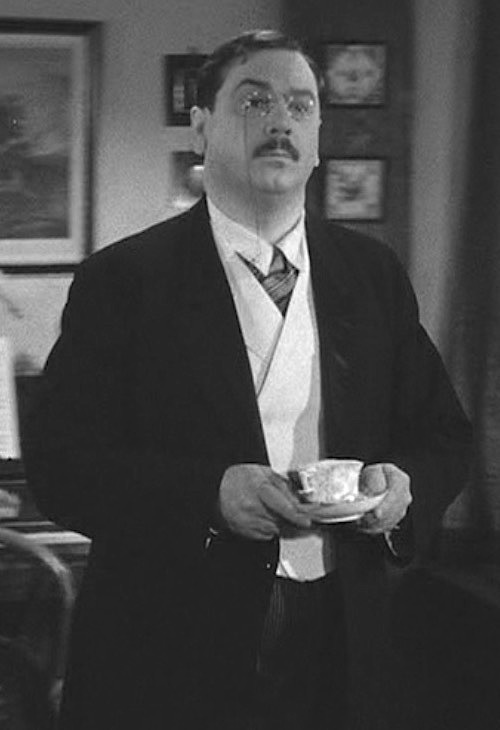 During its five-season run, Boardwalk Empire highlighted the spectrum of Prohibition-era men’s fashion from Jimmy Darmody’s street tweeds (link) and Mickey Doyle’s comic bowler-topped sack suits to Chalky White’s natty plaid suits accented by bold bow ties and Nucky Thompson’s distinctive take on white tie (link). John F. Kennedy, 35th President of the United States. I’m apologizing in advance for the large amount of photos in this longer-than-usual entry, but I’ve never covered a real person before and the abundance of available images was extraordinary. I have about 60 or so archived that I didn’t even use for this. Not every commemoration on BAMF Style is a happy one. 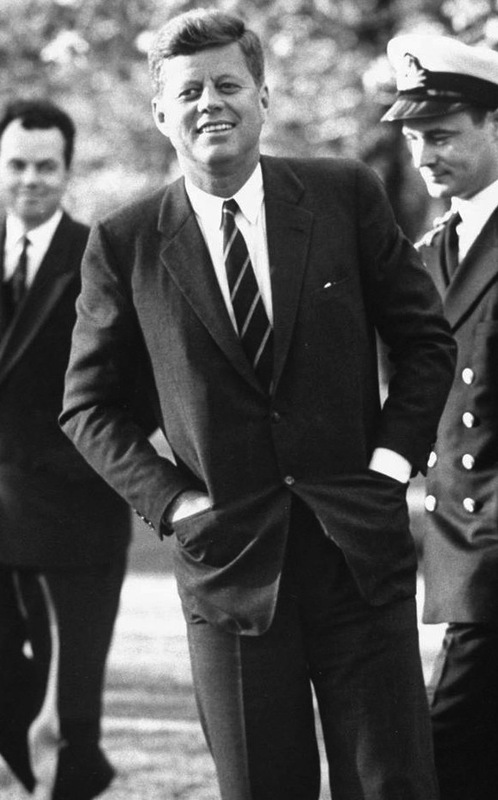 To honor JFK on the 50th anniversary of his assassination, I’ll be examining the style of a man often described as our country’s most stylish president. Whether he was in his office, at a cocktail party, or sailing off of Narragansett Bay, the Kennedys’ style captured the attention of the nation, with men taking hints from Jack’s fashion-forward sartorial sense and women envying Jackie’s elegance. Continuing our Week of Weddings, we have a two-parter today from “The Grown Ups”, the twelfth and penultimate episode of the third season of Mad Men. 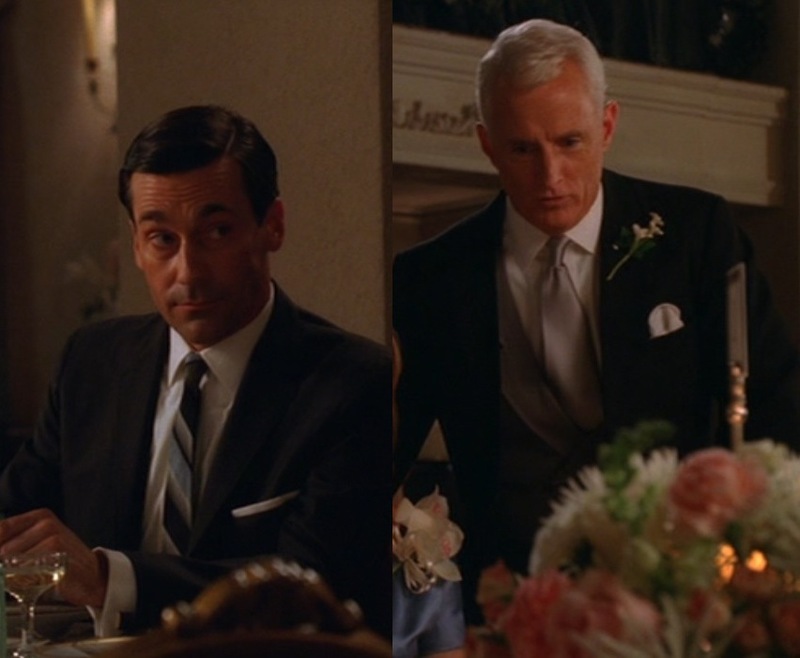 Jon Hamm as Don Draper (left) and John Slattery as Roger Sterling (right) in the third season Mad Men episode “The Grown Ups”.